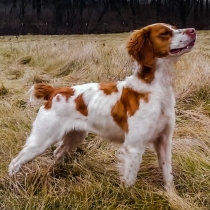 Took my Springer Brittany cross out for her second time on in bush on Saturday. ( she's 6 months) She flushed a grouse and a woodcock ( I saw neither). This bird was flushed by me after the dog had walked by. I shot and thought I missed in the dense brush, but Winnie found him on the ground. She was so excited she stood there barking! Will have to work on the retrieve, but I probably wouldn't have found him without her. Looks like you a have a fine hunting partner there. I wish you many years of enjoyment hunting with her.